Taylor Mosera graduated from the United States Military Academy in 2012 with a degree in Systems Engineering and was commissioned as an Army Intelligence Officer. Taylor served in the Army for five years and specialized in Signals Intelligence with the Joint Special Operations Command at Fort Bragg, NC. He later served as a Battalion and Brigade intelligence officer and Aide de Camp for the 7th Infantry Division at Fort Lewis, WA. 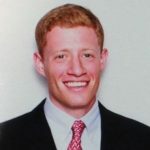 He has started his civilian career as an intern at Goldman Sachs and is currently an MBA candidate in Harvard Business School’s Class of 2019.